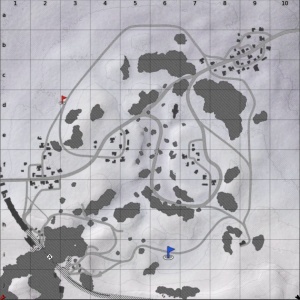 Frozen Pass is a ground forces map available in all modes. It is a fictional location, added in Update 1.57 "Battle March". 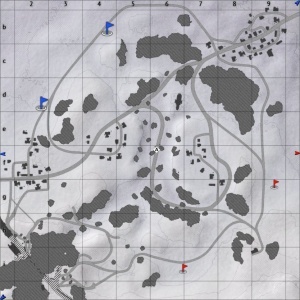 The map is quite small compared to other ground forces maps, meaning most of the combat takes place at reasonably short range. It is set in a snowy alpine region, with a few small clusters of buildings dotted around the map, and a larger town in the Northeast. A destroyed rail bridge runs down the west of the map and the rail line continues through a tunnel in the Southwest of the map; teams typically fight for a capture point located in the tunnel. Players can use a road that runs round the edge of the hill (which the tunnel runs through), to get round the side of enemy tanks, fighting to control the tunnel. 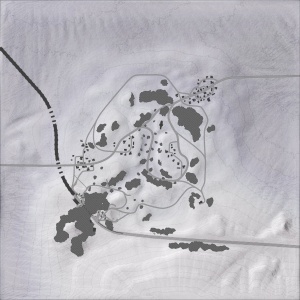 The middle area of the map has a number of hills, with a road running through a slight valley in the very center. A capture point is often located in the middle of this road, among a number of destroyed vehicles and rocks. Players capturing this point are vulnerable to enemy tanks shooting down on them from the hills on either side, or enemy tanks advancing down the road. The Northwest of the town consists of a small town; it is separated from the middle area of the map by a pair of rocky hills; although a small passage running between the hills does connect the two areas. Battle in the town are generally at very close range, with players fighting between the buildings, or around the passage to the middle of the map. Once a team captures the town they tend to try and push towards the other teams spawn point. The tank battles map is 2km x 2km (but is restricted to 1.2km x 1.2km). The air battles map is 65km x 65km. A battle between two armies for the control of the mountain pass. This map is a fictional location "inspired by the Alpine landscape". There are three Capture Points. One point is in the rail tunnel (Southwest corner of the map), another is on the centre road, and the final one is in the northwestern town. There are two capture points, each belonging to a team. The capture points are located on the main road that runs across the map and on a hill in the south of the map.